In today's episode of Pricing Page Teardown, Peter and I dig into the battle between tech journals The Information and Pando. The Information gives their readers up-to-date and interesting technology news. They also offer up an organized website with lots of great indices and org charts to really help their readers understand the tech world inside and out. Pando dives deeper into CEO and executive profiles, leveraging the community aspect of their platform to provide more focused and investigative journalism. Each media company is thriving in their own niche market and understand what it takes to make a volume play for the right kind of customer. We'll take a look at how The Information and Pando stack up in terms of positioning and pricing strategy. By really nailing their value propositions and offering the right kind of features, we'll see which tech journalism site comes out on top. The Information doesn't present a lot of differentiation on their pricing page, but they know the kind of value their journal provides and communicate it well. Each of their four available plans offers access to all of their article content and access to the online community. They anchor the price of their Yearly package at $399 as their most popular and then scale up to an All-Access tier by offering guaranteed event access and the option for plus one. This access nearly doubles the price at $749. What's really interesting is their $199/year Young Professionals tier. Open to anyone 30 and under, this acts as a great hook for up-and-coming businesspeople to start reading as their career is getting started. Once they're more established, and past their 30th birthday, these customers are more likely to pay the doubled increase to keep the account going. 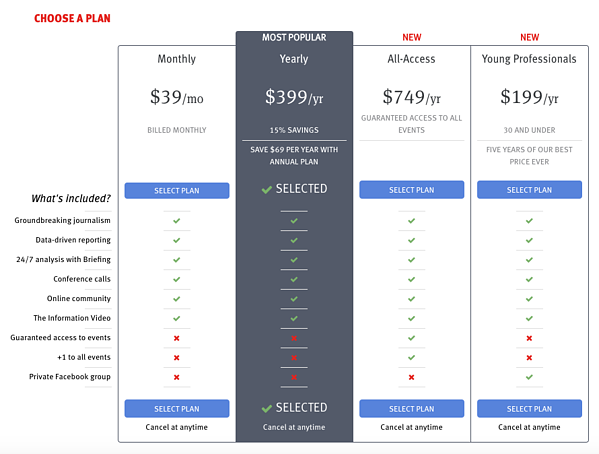 Pando takes their pricing in a completely opposite direction, offering a single plan at $10 a month or $100 a year. This positions Pando for a much different niche than The Information. The Information knows that as a provider of in-depth technology reporting, they're able to position their company as an entirely paid publication. Pando is trying to get as many customers as possible with their static pricing tier. 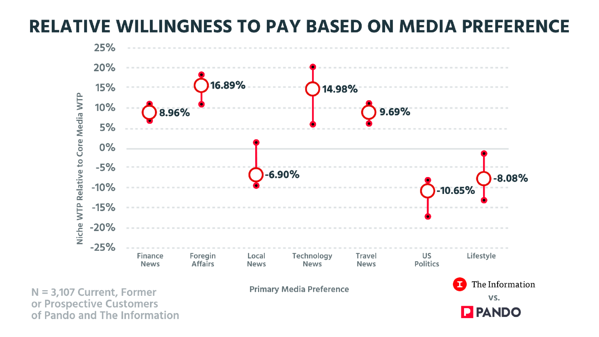 When we take a look at the relative willingness to pay based on media preference, it's plain to see that people are happy to pay a premium for certain types of content. The 3,107 current, former, or prospective customers we surveyed were willing to pay 14.98% higher on average for technology news. If The Information or Pando were reporting on US politics or lifestyle media, their pricing just wouldn't work. The only other type of media that beat out technology was Foreign Affairs at 16.89%. We also found that reading frequency affected customers' willingness to pay, as well. Someone who is entrenched in the industry and reading the news every day is much more willing to pay than someone reading a few times a week. 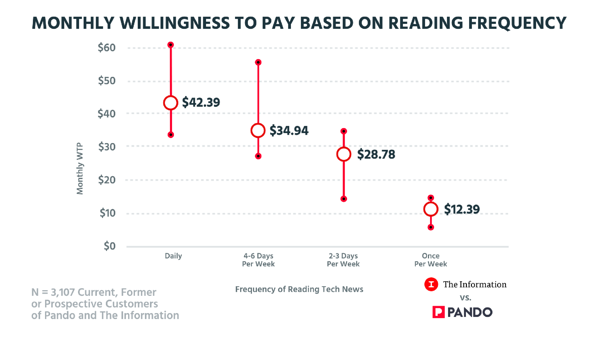 For daily readers, the average willingness to pay is $42.39 but flexes up to more than $60 a month. If we step down to between four and six times a week, it remains relatively the same averaging between around $25 and $55 per month. Where we see a significant decrease is when the customer is only reading the news two to three times a week. Their willingness to pay starts at a little over $10 and only flexes up to around $30, which was the low end for daily users. The Information is sitting pretty at $39. They're nailing the monthly price for people reading between four to six days as well, and are just at the lower end for the daily readers. Pando's $10 a month plan is below the low end of the market. Once-a-week readers are already willing to pay $12.39. The simplicity of Pando's plan works in their favor when going after an all-out volume play, but they could be just as successful with price increases to account for a higher average willingness to pay. While prices vary for these two publications, their features are spot on. When we take a look at the value matrix, everything being offered by both Pando and The Information is in either Add-Ons or Differentiable Features. We know that technology journalism drives a higher willingness to pay than other types of media and the features being offered reflect a clear focus on the quality of content as well. 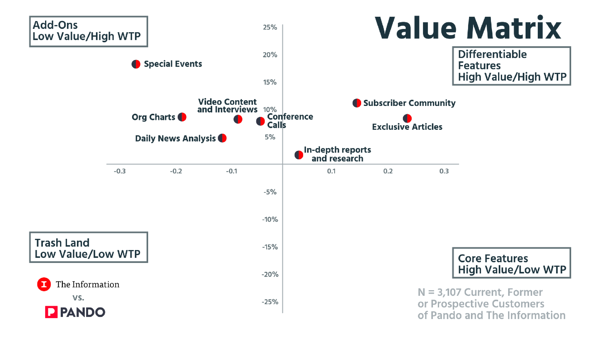 The key Differentiable Features like Subscriber Community, In-depth reports and research, and Exclusive Articles are offered by both companies, but only The Information is capitalizing on their value. Both Pando and The Information are nailing their main value proposition. But where Pando offers access to their events, livestreams, and video archive in every package, The Information utilizes Add-Ons by offering up guaranteed access in their All-Access plan. That tells the potential customer that even though they're able to go to the events at the monthly or yearly price, they're not always going to be able to get in. Pando and The Information are both offering great technology journalism, but their pricing strategies couldn't be more different. The Information is going after the customer who reads technology news every day. 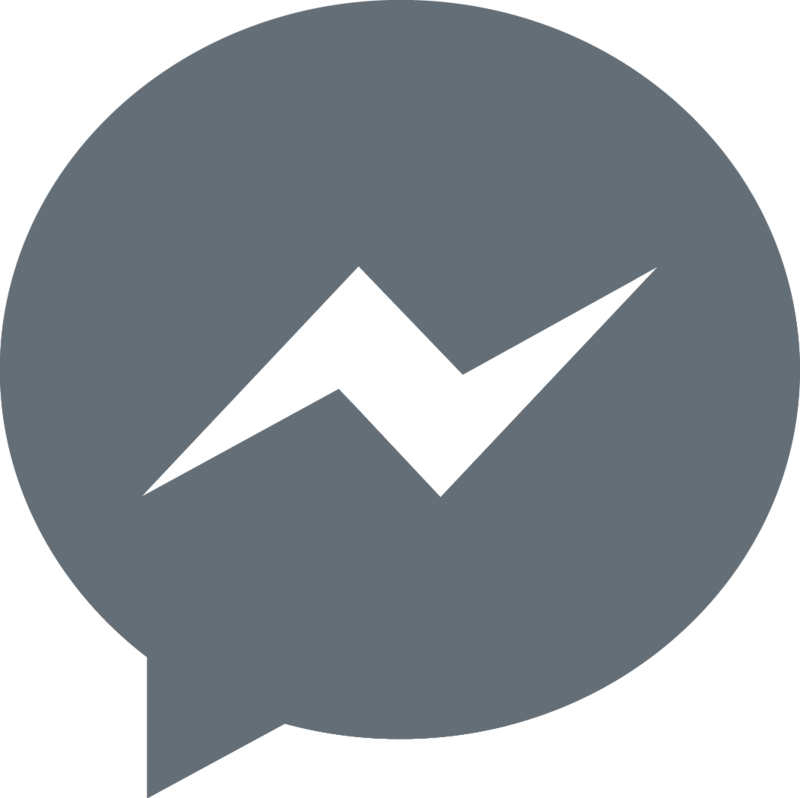 They're interested in high-quality insights and data-driven posts about the market. Pando's low monthly price opens up their publication to a much wider audience, bringing in the causal readers as well. 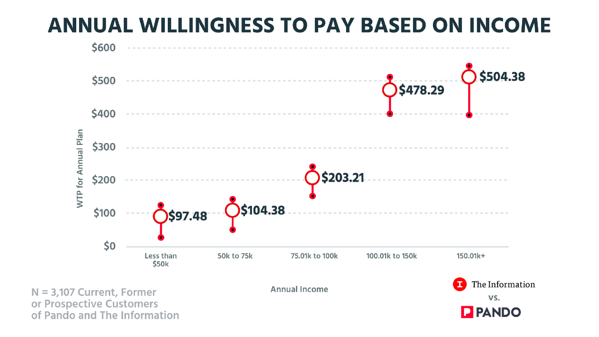 When we surveyed 3,107 current, former, or prospective customers willingness to pay for both Pando and The Information based on their income you can see where each company is focusing their pricing. Pando is making a serious volume play at $10 a month; they're positioned to attract customers making from $0 to $100K easily. While they undersell their value for customers making between $50K to $100K, the willingness to pay for each of those tiers swings from $5 up to almost $30. The Information, at $39 a month, is positioned higher. They could easily go up $10 and still be well within the range for customers with an annual income between $100.01K and $150K. With a significant amount of technology professionals in that income range, $47.39 a month wouldn't be that much of an increase for The Information to make. 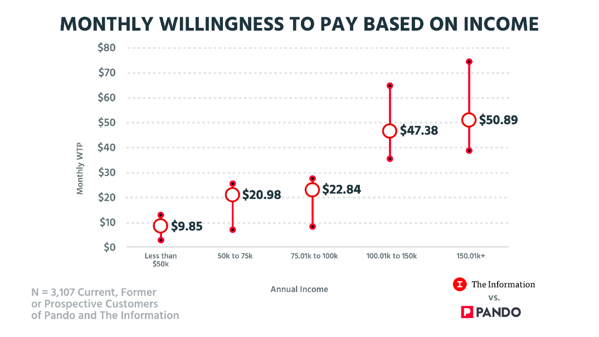 We see the same thing in the annual willingness to pay based on income as well. With their $100 a year package, Pando is positioned perfectly for people making up to $75K per year. For up to $50K, most customers are willing to pay $97.48, and for those earning between $50K and $75K, it bumps up slightly to $104.38. This helps them compete with The Information's $199 per year Young Professional package. A large majority of new technology professionals will likely be working up to the $75K + salary band as they gain experience. The Information offers a yearly package of $399, which for their target $100.01K to $150K band is well under the $478.29 average willingness to pay. 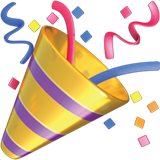 When we surveyed customers making $150.01K + per year it jumps up to $504.38 as well. This means that The Information could likely adjust their annual price up by $100 without issue. The big dogs making more than $150.01K per year are more than willing to pay it. Both The Information and Pando have positioned themselves to attract as many of their target customers as possible. With The Information going after the established professionals and Pando going after pretty much everyone else, they're both seeing success in their separate niches. It's important to note, however, that The Information could benefit from a reevaluation of their current pricing structure. The willingness to pay data we collected shows that they could easily scale up without issue. It would be a great A/B test for them to start offering increased pricing for a percentage of incoming website traffic. While both companies are successful, both Peter and myself would go for The Information over Pando. Having a few different pricing tiers is attractive and their overall approach feels premium. The Information has done a really good job of positioning their content to show its value and their data-driven articles help you do your job better. Pando, on the other hand, offers content that is focused more on the community surrounding technology.